Garden Manager – Business Version is designed to help Garden Owners manage their day-to-day operations. Whether you own a string of community gardens or just one, Garden Manger – Business Version can help you manage your members, volunteers, locations, and more. Services the software offers include: Categorization and tracking of garden participants; Cataloguing of the prices of community garden produce, as well as a comparison option for retail prices of competitors; Economic valuation of all garden activities and yields; and a Garden Assessment tool that provides an up-to-date analysis of what is being grown in each plot, as well as the status of that crop. Keep doing what you love and leave the programming to us. 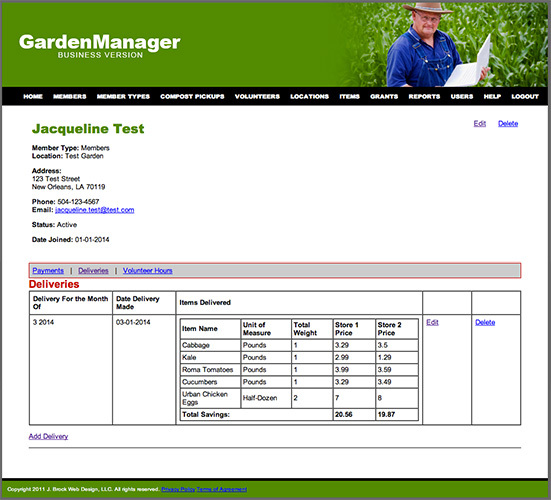 With Garden Manager – Business Version you can produce real-time reports on activity at your gardens. For a small monthly fee, you will have a web-based solution at your fingertips. Why Choose Garden Manager – Business Version? Garden Manager – Business Version can give you real-time statistics on how you are helping to save your community’s natural resources by preventing materials from being dumped into landfills. I can all help you to calculate how many families you are exposing to healthy fruits and vegetables, how many hours your volunteers spend helping you beautify the garden and neighborhood and more.